Johnson is the “B” receiver. The “A” stats belong to K.J. Osborn. That depth at the receiver group is why the Bulls have the one of the top offenses in the country, and why QB Tyree Jackson is 21st in the nation and 1st in the MAC in passing yards. It’s no surprise that UB’s first three opponents chose to focus on Johnson. Last year, “AJ” scored 14 touchdowns and ranked second in the NCAA in receiving yards. He is a second-team All-American and a rare combination of size, speed and hands. He demands double-teams and demands to be the focus of any defense. Maybe that’s why his numbers are a bit down though three games. But if a defense is going to focus it’s attention and safety help on Johnson, other players are going to get single coverage. That’s what Osborn has been able to dominate. He doesn’t yet get the attention that Johnson does, but that hasn’t stopped him from putting up those ridiculous numbers. Saturday against Eastern Michigan, a top MAC defense, Osborn had 7 catches for 188 yards and three scores. That included 70 and 75 yard scores. A good quarterback like Jackson is going to recognize who is getting less coverage. He did, and that’s why Osborn had a big game. Knowing how a defense if focusing its coverage is one thing. Having a quarterback who sees that, and is willing to spread the ball around is another. It would be easy for Jackson to look at Johnson on every play, and feel like he has to “feed” the ball to his star player. Bulls Head Coach Lance Leipold says that’s a tribute to Jackson and the way he’s being coached. 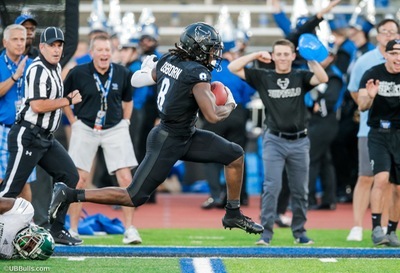 Osborn emerged last year as the Bulls second leading receiver. He has raised his game from a #2 receiver to more like a #1B to Johnson’s #1A. “KJ came in at the same time as Tyree. Tyree’s confidence in KJ’s ability has been there since the first fall. It’s come out a little bit this week. But everyone inside our walls know what KJ does for this program and has great confidence in him,” said Leipold. It doesn’t stop with Johnson and Osborn. There are other weapons in the passing game. George Rushing is a transfer from Wisconsin who brings veteran savvy and experience. Sophomore Antonio Nunn is a big play deep threat. Redshirt freshman Charlie Jones is averaging almost 19 yards per catch. Tight ends Tyler Mabry and Zac Lefebvre are also big, athletic targets. Osborn knows it can’t be easy on defensive coaches trying to figure out who to cover.